Medieval Mayhem is a family-friendly fun day with all manner of medieval activities and entertainments. It is organized and run by the Huon Valley branch of the Society for Creative Anachronism. The event will take place in Geeveston, Tasmania on Saturday, April 21 from 10am till 4pm. Admission is free. 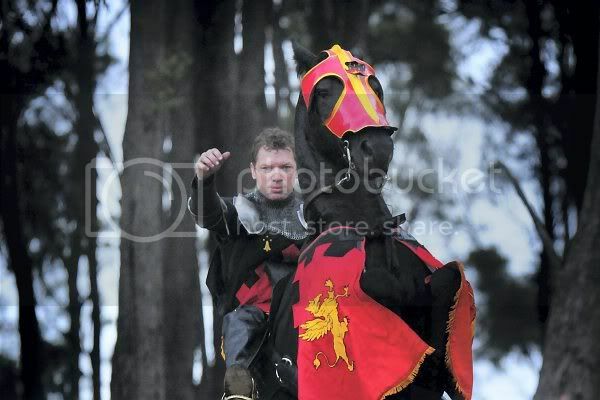 "Phillip Leitch, jouster and master horseman, idol of millions, darling of medievalists on seven continents and close personal friend to royalty, will be putting on his show at Medieval Mayhem. Astride his mighty steed Valiant, he will show the skills that won him his place as a coach on Full Metal Jousting, and when everyone is thoroughly gobsmacked he’ll even pose for photos and sign autographs. What more could you ask? " For more information about this event, check out the Medieval Mayhem facebook page. Wow! I only wish that was true and I was that cool!